The wedding invitation is the official announcement you make to your loved ones; therefore, it has to be something unique and personal that truly speaks for the importance of the occasion. Wedding postage stamps are often that very special detail that can make the invitation effortlessly stand out. Using a custom wedding stamp is a subtle way of personalizing your wedding invitation, without being too straightforward. Most wedding postage stamp providers have several customization options you can choose from. Where to Order Wedding Postage Stamps? Here are the main wedding postage stamps customization services available online. If you are looking for more customization options, check out our Customized Postage Stamps page! 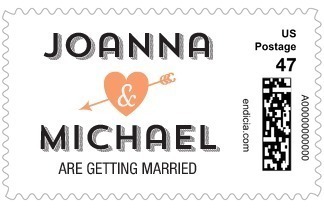 At Stamps.com, you can create unique wedding stamps using one of their designs. You can also create your very own unique wedding stamps using a picture or image you like. For more information about this service, check out our comprehensive Stamps.com review. 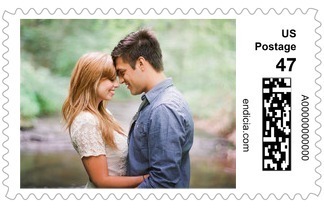 Minted.com offers many customization options for your wedding stamp. You can use the templates and designs they offer and add your own photo on top. Their templates are neatly separated according to color palettes, so you can be sure your custom invitation and postage stamps won’t clash with the rest. WeddingPaperDivas.com is the perfect place for couples who have a very specific wedding postage stamp design idea in mind. They do not offer such a great number of premade templates, but they have more customization options. If you have a little bit of time to spend researching ideas, then Zazzle.com might be the place for you. They have thousands of wedding postage stamp templates to choose from. Where do you purchase your custom wedding stamps from?